There's a deep sea battle for up to $2000 in daily casino bonuses this summer at metro-style Lucky Club Casino. 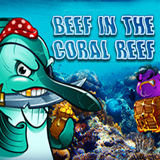 During the Beef in the Coral Reef bonus event, claim up to 200% deposit bonuses that include up to 100 free spins on the Duel in the Deep slot game. Beef in the Reef casino bonus event continues until August 31st at Nuworks casino. When matching Fighting Fish appear on Duel in the Deep's first and last reels free spins with multipliers are triggered. When a Swordfish appears on the first and last reels, choose one of them to do battle for you. Five free games with a 2X multiplier begin the bonus round and each time the player’s fish wins a fight, five more free spins are added and the multiplier increases. Lucky Club Casino offers dozens of unique games from Nuworks Gaming. With a choice of secure banking options, the popular online casino welcomes players from all over the world.